"A performance of great vitality and verve"
Terry performs as a trio, with the lovely vocalist / pianist Grace Field and a cello player. Terry, a former member of the two-time Grammy Award winning group "Chanticleer," has been nominated for 6 Grammy Awards for his own Christmas album and he's performed at the Metropolitan Opera, Carnegie Hall, and Moscow 's Svetlanov Hall. Terry's voice can be heard on every major record label with a variety of artists from Madonna to the London Philharmonic. 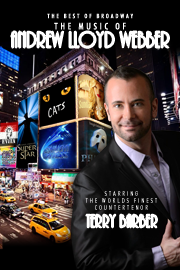 During this 90 minute show you'll hear songs from Cats, Evita, Jesus Christ Superstar, Sunset Boulevard, The Amazing Technicolor Dreamcoat, Phantom of the Opera and other Webber hits.